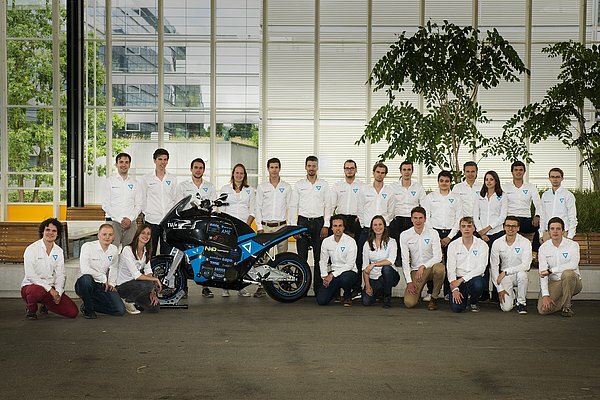 To show the world what electric transport can do: that is the goal of STORM Eindhoven, a team of 23 students from Eindhoven University of Technology, in its round-the-world journey in 80 days on self-built electric motorbikes. On Sunday 14 August a spectacular event in the center of Eindhoven will mark the departure of the team on its STORM World Tour. After two years of preparation, the students of STORM Eindhoven are ready for the ultimate challenge: 26,000 kilometers in 80 days. The whole route has been mapped out and scouted day by day. The journey takes in the northern hemisphere, starting in Europe and via Central Asia and North America before ending, back in Eindhoven, on 2 November. The team will ride two electric motorbikes that it believes represent how electric transport should look: quiet, efficient and with sufficient range. The motorbikes have a top speed of 160 km/h and can ride 380 kilometers before needing to be recharged thanks to the battery pack designed by the students themselves. The batteries – 24 separate cartridges and good for up to 28.5 kWh energy – can also be replaced by a fully charged battery pack within seven minutes. Every day the motorbikes’ batteries will be charged via the local power grid, at companies, universities or private homes – together making up the ‘STORM Grid’. The team will also be participating in all kinds of events during the journey with the aim of convincing the world of the potential of electric mobility. The ‘kick-off’ of the STORM World Tour is scheduled for Sunday 14 August. From 11:30 till 13:00 the 18 Septemberplein, in the center of Eindhoven, will be the venue for a spectacular event with music and presentations from ambassadors former Prime Minister Jan Peter Balkenende and TV presenter Rick Nieman as the team departs on its journey. The STORM World Tour can be followed live over its 80-day journey via a dashboard on the team’s website, www.storm-eindhoven.nl and via social media (#storm80days). The team will report on its journey through blogs, vlogs, photos and almost daily video updates.